What: Prolific and unpredictable Giant Sand leader, singer, songwriter, and producer, equally adept at evoking the close-quartered intimacy and wide-open expanse of desert life. Why: Gelb’s new solo record The Coincidentalist will bring him back to town for the first time since he led his gospel-backed ‘Sno Angel Like You project here in December 2006. How: Tickets for the show are $17.50 in advance but courtesy of Collective Concerts, I’ve got one pair of passes to give away for the show. 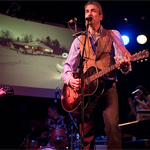 To enter, email me at contests AT chromewaves.net with “I want to see Howe Gelb” in the subject line and your full name in the body. Contest closes at midnight, December 4. What else: Under The Radar has an interview with Gelb.